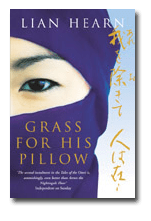 The first book I finished reading after the first of the year was Grass For His Pillow, Book 2 of Lian Hearn’s series, Tales of the Otori. Of course, as is customary when reading part of a series of books, I prefaced Book 2 with Book 1, Across The Nightingale Floor. Although I didn’t read Nightingale after the New Year had begun, I feel the need to make some observations about it before continuing with my discussion on Book 2. Across the Nightingale Floor is the first of three novels called the Otori Trilogy. Set in an imaginary, ancient Japanese culture, the novel’s hero, 16 year old Takeo, is born into a spiritual people known as the Hidden but discovers his destiny as one of the Tribe—assassins and spies with unusual powers. As he unknowingly becomes a pawn in a battle between fighting warlords, he learns to make use of his powers and must decide where his loyalties lie. The story of treacherous warlords, political intrigue, and the intensity of first love, in a world ruled by formal ritual and codes of honor, will captivate readers of all ages. When recently discussing Nightingale with a friend of mine, he described it as a ‘checklist’ and said that he hadn’t continued with his reading because the story hadn’t captured him. While I could see his reasoning for such a description -nobody boy (from literally, nowhere) loses all, vows revenge, discovers awesome powers and becomes something more than he ever thought he could be- it wasn’t something that deterred me from reading and it certainly didn’t disappoint me. If anything, once the basics were out of the way, I was quite intrigued with the story. Perhaps it was the setting, which was based on Classical Japan and drastically different than anything I’ve read. I was fascinated by the descriptions and by the characters. To be brief, I thoroughly enjoyed the story and was happy to move straight on to Book 2. 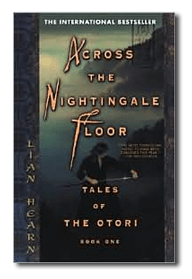 In Book I of the Otori trilogy, Across the Nightingale Floor, Lian Hearn created a wholly original, fully-realized fantasy world where great powers clashed and young love dawned against a dazzling and mystical landscape. Nightingale was named a New York Times Notable Book of the Year, one of Book magazine’s best novels of the year, and one of School Library Journal’s Best Adult Books for High School Readers. I burned through this book even faster than Nightingale. I was so caught up in it that I was actually surprised when I got to the end. Surprised and deeply chagrined, since I don’t happen to own Book 3 yet! Despite trying to read Kaede’s points of view quickly in order to get back to Takeo’s as I often did during Nightingale, while reading Grass I began to appreciate Kaede’s character much more. Her longing for a home and family that had not seen in over half her life; her sadness at the state her household had fallen into prior to her return; her determination to prove that a woman is as capable as a man… all of these things made her more believable than she had been in Nightingale and made me, as a reader, much more invested in her future and her fate. I was also impressed with Takeo as he matured during the course of this book, and with his decision about who he was going to be. Despite the ramifications of his actions, he did what he knew he had to do, both at Hagi and at Terayama, and he’ll face the consequences when they come. When they do, he’ll most likely triumph, anyway. This entry was posted in 50 Books, review and tagged 50 Book Challenge, book reviews, Lian Hearn, Tales of the Otori. Bookmark the permalink. Wonderful series. I never thought of the “checklist” aspect mentioned by your friend, although I don’t disagree at all. But for all its standard building blocks, more than any other series I’ve read the characters make unexpected choices (sometimes leaving you screaming “Nooooo!”). I loved it. Oh, I agree completely! I can’t wait until my budget will allow another book purchase! Or three more book purchases, since the series has two more books than I thought it had! Dang it! You’re making me want to read yet another series of books! Would I do that?! :o) I can always loan you what I have if’n ya wanna check ’em out. I have these, haven’t gotten around to starting them. Will get to it eventually they look like a great series!